In the past, the Red Poets have performed at many benefits and we always give our services for free. Some of the many causes we have supported are anti-opencast groups, trade union fund-raising, the Cymru-Cuba society and CND. We would be delighted to read our brand of entertaining,topical and often humorous verse at any events organised across the country. Among our ranks we have included most of the winners of the John Tripp Prize for Spoken Poetry (including Clare Potter, Peter Read, Ifor Thomas and Emily Hinshelwood), as well as top performers like Mike Church and Chris Williams. Please contact us if you wish to have a benefit night for your cause. 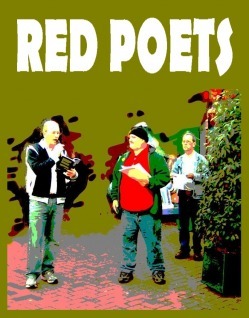 Red Poets 21 is now available from 7 Stryt Gerallt, Wrecsam, LL11 1EH for £4 + 90p postage. Red Poets acknowledges the financial support of the Welsh Books Council. Mae'r Beirdd Coch yn cydnabod cefnogaeth ariannol Cyngor Llyfrau Cymru.